The ‘So What’ chord is a quartal chord voicing which means it is made of a stack of perfect fourth intervals. Unlike a pure quartal voicing, the So What chord has a major third interval on top. Introduced by the pianist Bill Evans, the ‘So What’ chord is a modern sounding voicing that sounds great when you have a minor chord with the 5th in the melody. The So What chord voicings has many different uses. It’s great for moving in parallel and to rehmonise chord changes. This is because stacked 4ths are harmonically ambiguous which gives you a certain degree of freedom to impose the voicing over different harmonies. 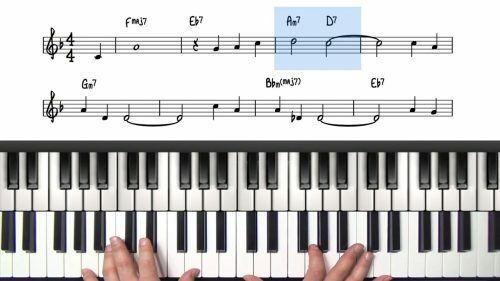 In this lesson, we explore the construction of the voicing and then apply it to a number of well known jazz standards. We create a beautiful ballad arrangement and then we apply upper structure triads and some interesting applications of drop 2 harmony. We explore how you can use So What voicings not only for minor chords, but also major chords by creating a quartal maj13 voicing. Learn the So What Chord in all 12 keys. You can move up or down the entire octave chromatically which is a useful exercise to get your fingers used to 'sideslipping' the voicings. Sideslipping is when you move the entire voicing shape up or down chromatically. It's useful to take the voicing around the circle of 5ths and also choose keys at random to make sure you are familiar with the voicing shape in all 12 keys.